March is the month of luck, and St. Patrick’s Day is right around the corner. But, sometimes your luck turns sour! Don’t worry, though, because when it comes to your HVAC system, we can help! Here are 7 not so lucky noises to look out for & what they mean. A humming sound generally isn’t serious, but is often a warning that something isn’t at 100%. Loose parts and refrigerant piping can cause vibration and, if left unchecked, can lead to a more serious maintenance issues. If the compressor hums and refuses to start, there may be an issue with the motor. Loose wiring could trigger this noise as well. Clanking is another sign of a loose or out-of-balance part. The compressor itself may have come loose, possibly requiring a replacement. This sound can also mean the indoor blower or outdoor fan and its blades are out of balance and hitting other parts. Unfortunately, this can potentially lead to more serious complications if left unresolved. Constant or ongoing clicking is not typical of a healthy HVAC system. The clicking of electrical components at start-up and shutdown is a normal however. Any additional clicking could be a sign of a defective control or a failing thermostat. A buzzing noise from your outside unit could mean a variety of things. Loose parts, the air filter needing to be changed, debris in either the indoor or outdoor unit, and possibly the blower going bad or out of balance. It can also mean things such as the outdoor fan motor or fan blades being loose or refrigerant leaks, resulting in your air conditioning freezing up. If it’s conditioning not cooling, this could be why. You might also want to check the copper lines running from outside to inside to ensure nothing is rubbing and checking if the condenser coil needs to be cleaned. For some units, this sound is normal upon start-up. However, if it’s a new sound that you haven’t heard the unit make before, the outdoor fan or indoor blower could be going bad. The blower wheel and housing will also squeal when they malfunction. For starters, when you hear chattering and rattling, check for loose screws or bolts in the unit’s casing. Also look into cleaning the condenser coils and make sure no leaves or twigs have clogged up your change your indoor air filter. 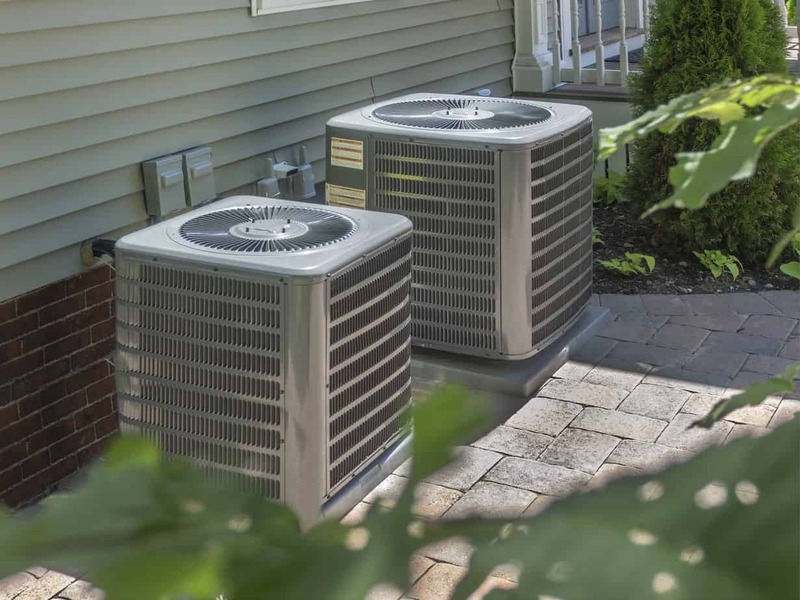 If the issue persists, it can mean that your air conditioner is starting to deteriorate, and some of its parts are loosening. If your system is omitting a high-pitched whistling or screaming sound, shut the air conditioner off and call a professional immediately! This is usually a sign of refrigerant leak, which not only damages your air conditioner but can also be threatening to your family’s health. It may also indicate high internal pressure inside your compressor, which is also very dangerous. If your air conditioner turns off on its own, it’s a good thing! It means a sensor is doing its job to protect you from a potentially hazardous situation. In any of these cases, it’s a good idea to turn off your central air unit as a precaution until it can be inspected thoroughly and professionally. A yearly inspection and tune-up can prevent future problems, as air conditioners can be costly to repair and even more so to replace. Though it is inevitable that you will eventually need to replace your system, knowing what to look out for, having annual inspections and tune ups, and turning to professionals when needed will all help prolong the life of your HVAC system, bringing you many “lucky” HVAC years to come. Why is my toilet bubbling and gurgling? Why does my sink fill up when I run the dishwasher?